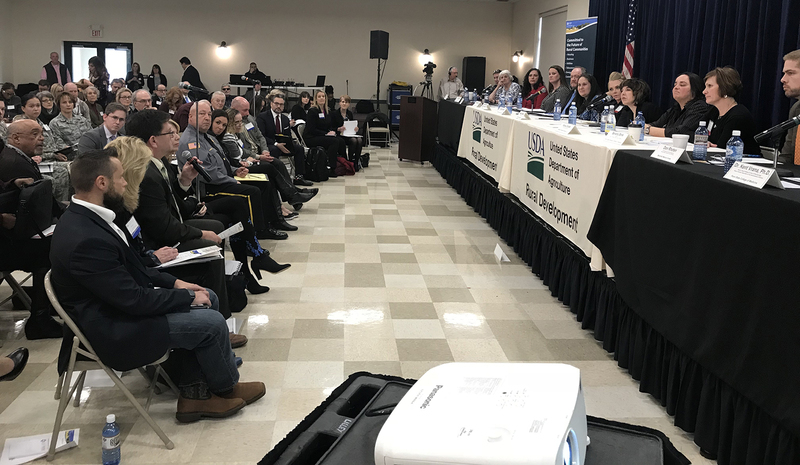 The U.S. Department of Agriculture convened the first of a series of monthly local roundtables March 14, in Dauphin County (Harrisburg), Pa. to promote awareness and better understanding of the support rural communities need to address addiction and opioid misuse. The inaugural roundtable was convened in Pennsylvania by Anne Hazlett, the USDA’s assistant to the secretary for Rural Development and also brought to the table several local officials from rural counties in the state, including a first responder from Adams County, a commissioner from Bradford County, a judge from Lackawanna County and a coroner from York County. These county leaders were joined at the event by representatives from USDA, Pennsylvania state government, area universities, faith-based organizations, hospitals, recovery centers and law enforcement agencies. After opening remarks from Hazlett, attendees heard from Kerry Benninghoff, majority policy chairman of the Pennsylvania House of Representatives and a former county coroner in Center County, Pa. Bennighoff has convened 10 hearings on the opioid epidemic in localities throughout the state, and shared key takeaways at the roundtable. “It’s amazing how many people in our communities think this is someone else’s problem,” he said, highlighting the need for a change in mindset when it comes to the opioid epidemic. Benninghoff also suggested that stakeholders consider a careful distinction between need for addiction treatments and demand for those treatments. The terms are at times used interchangeably, he said, but a major impediment to effective response to the opioid epidemic lies in the difference between these terms – those who need treatment are typically not demanding them, creating additional challenges for local governments. To provide further context for the roundtable discussion, Shannon Monnat, associate professor of Sociology at Syracuse University, provided an academic’s overview of opioid misuse in rural America. Monnat titled her presentation “Landscapes of Despair,” a reference to large-scale economic and social distress throughout the country that she cited as a driver of hopelessness and despair. To overcome this epidemic, she continued, we must focus not only on supply reduction and treatments for individuals, but on the large-scale underlying factors — or “upstream” drivers — of this societal challenge. Monnat also shared data to demonstrate that the “rural opioid epidemic is not monolithic,” and that rural communities across the country have both the highest and lowest overdose and fatality rates resulting from opioid misuse. According to her research, one predictor of how acutely a rural county is impacted by the opioid epidemic is the jurisdiction’s economic dependency type: counties in which mining is a major economic driver, for example, have significantly higher drug-related rates per 100,000 residents than farming communities. Throughout the roundtable discussion, first-hand accounts of the opioid epidemic in rural communities were brought to the table. Some of these accounts — like a local official’s statement that her agency hesitates to issue public warnings about lethal batches of illicit opioids for fear that individuals will proactively seek out the supplier of that batch in their search for the most potent high — likely also reflect the grim reality in urban and suburban communities. Other impacts, on the other hand, are likely more acutely felt in rural communities: a first responder shared that his agency was not equipped to handle multiple overdoses stemming from a single batch of drugs due to the fact that the agency has only six ambulances to address these and other urgent community health needs. Another speaker acknowledged the critical role of local task forces and coalitions to formulating effective responses to addiction, but noted it is often difficult for rural communities to find funding streams that support these collaborative groups. Attendees also shared accounts of resourcefulness and innovation that is helping to address issues more relevant in rural communities. Judge Michael Barrasse from Lackawanna County stated that in rural areas in Pennsylvania, local governments are teaming up to create regional drug courts in place of often resource-prohibitive single-county courts. A representative of a faith-based organization funded by Lancaster County highlighted the pivotal role of churches — often among the only settings where rural communities congregate — in formulating an effective response to addiction in rural areas. Technological solutions were also discussed for helping individuals in recovery access some treatments through mobile apps in areas where transportation to brick-and-mortar treatment centers is time- or cost-prohibitive given the geographic breadth of many rural areas. Commissioner Ed Bustin, a member of NACo’s Rural Action Caucus and Justice and Public Safety Committee attended the roundtable on behalf of NACo and the County Commissioners Association of Pennsylvania. In his opening remarks, Bustin shared an unfortunate moniker given to Bradford County by Newsweek in an article published in 2005: Meth Valley. In sharing this account, Bustin echoed a sentiment that has driven NACo’s work on the opioid epidemic in recent years — that the response to this epidemic must ultimately focus on addiction, rather than any specific substance, because if addiction is not addressed, another drug will replace opioids as the driver of the next epidemic. “Now that might not always work for me, as it might in Susquehanna County, or in Dauphin County, and so in the end, what we need is more of this interaction so we can hear directly from the folks in the communities being hit with the folks that are the policymakers and the decision-makers,” Bustin said. USDA’s remaining local roundtables on the rural opioid epidemic are scheduled for April 11 in Utah, May 9 in Kentucky, June 6 in Oklahoma and July 11 in Maine. NACo is partnering with Assistant to the Secretary Hazlett to ensure continued local representation at these roundtables. Hadi Sedigh is Managing Director of the NACo Counties Futures Lab. In this capacity, he helps to lead the organization's research, data analytics and knowledge sharing initiatives, as well as NACo's engagement with urban counties.